68% of UK businesses worry employees use mobile phones while driving for work, according to research by TomTom Telematics. 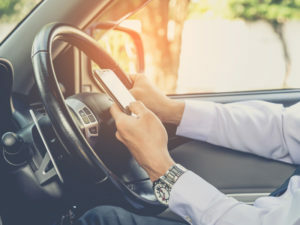 Despite the claim, 33% of organisations still hadn’t taken steps to prevent employees from using mobile phones while driving, whether through specific policies, training or education. Harsher penalties for people caught using their mobile phone while driving came into force on 1 March this year. The standard fine doubled from £100 to £200 and drivers can now be given a penalty of six points on the licence. Hands-free use has been shown to be as distracting as hands-on mobile phones, yet despite this, the research revealed 68% of organisations still allow hands-free use of mobile phones by employees driving for business purposes. Beverley Wise, Director UK & Ireland at TomTom Telematics, said, “It’s a problem employers’ must tackle if they are to demonstrate a genuine commitment to the wellbeing of their staff. “A clear policy on the use of mobile phones should form part of a best practice approach to road safety, but cultural change is also vital.